Proper nutrition is a powerful good: people who are well nourished are more likely to be healthy, productive and able to learn. Good nutrition benefits families, their communities and the world as a whole. On the other hand under nutrition is, by the same logic, devastating. It blunts the intellect, saps the productivity of everyone it touches and perpetuates poverty. If it is agreed that nutrition is as much required then quality and safety aspect of food can’t be undermined. In Pakistan, the nutritional status of population is not satisfactory. Improper diet is affecting people of all ages. It is a serious concern about health and well- being of the children, women and men. Similarly the food which is available to the masses is not meeting food quality and safety standards. That’s why exports in food items are decreasing day by day. Which is affecting badly the agro based economy of the country. To fulfill the needs and to combat the challenges faced by our country, University of Veterinary and Animal Sciences took the initiative and established the Department of Food Science & Human Nutrition under the umbrella of Faculty of Bio Science. The department has a highly qualified teaching faculty in relevant disciplines. The students are professionally trained in Food Science, Food Safety and Quality Management, Clinical Nutrition/Dietetics, Public Health Nutrition, and Biotechnology. For practical training of the students, the department has developed strong collaborations with many institutes & industries. The department engages in a wide range of collaborative projects with scientists in other departments and institutions. 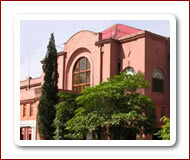 Department has well established classrooms and laboratories for the teaching and research. Laboratories are equipped with all necessary equipment which is required for an experimental work. Qualified technicians are looking after these laboratories e.g preparation of experiments, fixing equipment copying lab manuals etc. Food analysis lab is serving as a reference lab for salt iodinization program of Govt. of The Punjab. Commercial sampling is also being done here. Research priority areas are Bio Technology, Nano Encapsulation, Functional Foods and Dietary Fibers. To serve as a hub and a premier institution for knowledge generation, dissemination and technical human resource development for the uplift of the field of human science and nutrition in Pakistan. To provide consultancy and advisory services in health departments, hospitals, NGOs, teaching, research, and to promote collaboration between national and international universities in this specific field. To produce socially and ethically responsible graduates who will make a contribution to food safety related professions, and to society as a whole through quality education, research, and service.